Ten years later (1986), the second wave of PCs was just starting to be used by a small specialized group of office workers who were looking to master basic software. The number of wineries in the US had risen to 1,455. Twenty years ago, the Internet and E-commerce were just starting to be topics of conversation in business. US wineries had only grown to 1,755. It was just 10 years later that the important Granholm versus Heald decision that opened the door to Direct to Consumer (DtC) wine sales channel had been made. Facebook was probably in the planning stages and America had seen a surge of new wineries. The total reached 5,424. Cell phones were being used by many but they were relatively simple by today’s standards. The last report by the Wine Institute was from 2014, showing there were over 10,400 American wineries. Today, not only are Smartphones being used by practically everyone, but a growing number of Americans no longer even have landlines at home. Facebook membership is reported to be over a billion people and new wine apps are being released regularly. Computers and software have grown in sophistication to the point that few jobs still exist where you don’t have to use them. Today’s consumers are digitally transformed. Give them a moment and they can look up anything they don’t know, right on their smart device. Hotspots are everywhere. Some people stay connected 24/7. Yet in the face of all this technological change, most in the wine industry still try to employ the same strategies they did 40 years ago. When they use Facebook they use it as an electronic billboard. Engaging a customer to them is promoting that the winery is having a BBQ event on the weekend. Those individuals who have a true passion for wine, who share a bottle of wine nightly, have grown to over 10 million in the US. Not only have their palates become sophisticated, they have the affluence to build wine cellars and have now done so in their homes across America. Many of the better California wineries sell to a select list of customers and have extensive waiting lists to get a bottle of wine. DtC just recently passed the $2 billion mark and in the latest report grew 11% in the last 52 weeks alone. There is a growing mountain of evidence that among wine lovers change is almost constant. Yet no one in the wine industry seems willing to change anything. As that digitally transformed wine lover discovers that the fruit bombs of 8 and 10 years ago don’t have the same appeal (and California winemakers are dialing it back), what will happen as more and more people discover the joys of high quality low production imported wines? What will allow this change to happen (and quickly) are personal (individualized) sensory rating systems like Quini, and the new kind of wine tasting data such platforms can now make available to industry. Developed by a group in British Columbia (Canada), this sophisticated system helps almost every level of wine drinker craft their own preferences for wine. 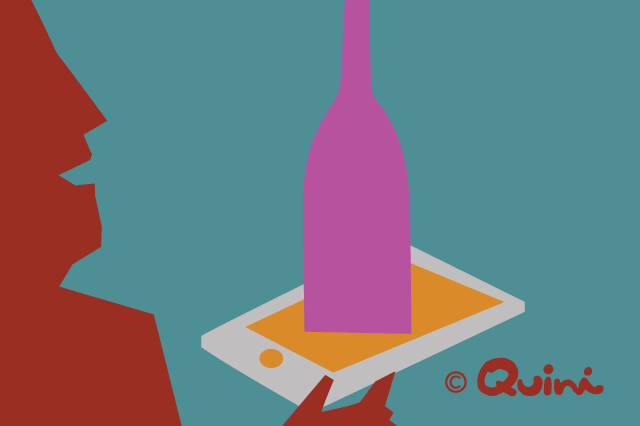 With Quini, wine drinkers can discover and trust their own palate. Should they desire to have it, they also have expert notes at their fingertips. Nearly 80,000 different wines have been included into their database with thousands of rich tasting notes helping to inform consumers like never before. It is time to stop worrying about which importer is handling your wine and start thinking about how to connect to the people who are accessing information from specialized databases and tools like Quini. It’s time to stop planning winemaker dinners across the country and start developing a real following of loyal customers that you engage (having real conversations) on a regular basis. It’s time to treat wine club members as valued individual customers….not cash cows. It is time for serious change from the wine industry! Mark is the co-founder of International Wine Professionals network, an online network of wine professionals focused on helping the wine industry become more competitive in today’s adult beverage market. With a true passion for wine, accompanied with a background in teaching technology and internet marketing, Mark is utilizing state of the art marketing techniques to increase exposure to the wine industry, from both a professional and consumer perspective.